When Cody Ross replaced Ryan Sweeney in right field the ninth inning of Monday night’s 7-3 victory over the Tigers, it was immediately suspected Sweeney had been dealt at the non-waiver trade deadline. Sweeney had injured his left throwing hand by punching a door in the Red Sox dugout after Tigers second baseman Omar Infante made a diving stab to rob him of a hit in the bottom of the eighth. After going 0 for 4, Sweeney let his frustration get the best of him. Sweeney injured the outside knuckle on his left pinkie and was unable to return to the game. “I just couldn’t throw the ball, so they had to put Cody in,’’ he said. Sweeney said he would likely have X-rays Tuesday. If he is placed on the disabled list, it would be his third such stint this season after missing six games with a concussion and 18 with a left big toe inflammation. But if X-rays show a fracture, Sweeney could be lost for more than 15 days, quite possibly the remainder of the season. Although it was expected that David Ortiz would come off the 15-day disabled list Wednesday, it appears the Red Sox designated hitter might not be back in the lineup by then. Manager Bobby Valentine expressed reservations before Monday night’s game that Ortiz, who has been on the DL retroactive to July 17 with a strained right Achilles’, would be ready by that date. 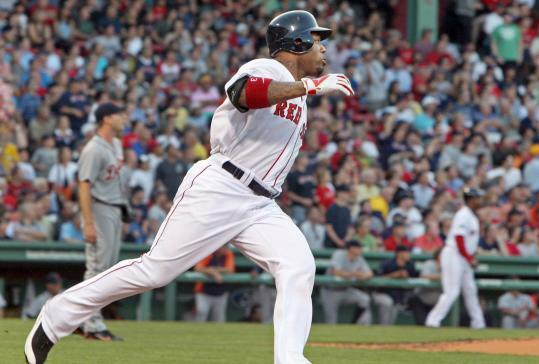 Ortiz remained in Boston during the first three games of a recent six-game trip to Texas and New York. After shedding his walking boot, Ortiz joined the team for the last three games of the swing and took some batting practice at Yankee Stadium. Ortiz was expected to do some agility drills Sunday, but he had to cancel that workout because he still felt some discomfort in his right foot. However, the manager was asked if there were any needs that needed to be addressed through a trade. “I like my team,’’ he said. “I think we’re a good team. If there’s any way [general manager] Ben [Cherington] thinks he can improve it this year and beyond, I’m sure he’s going to do that. Pedro Ciriaco, who drove in the winning run in each of the previous two nights in New York, was at shortstop Monday night as Mike Aviles sat for the second game in a row because of turf toe. “It’s not a life-threatening situation but it sure is an encumbrance,’’ Valentine said of Aviles’s injury. “We’re just trying to see what we can do to get that feeling out of there. Since their respective returns from the DL, Jacoby Ellsbury and Carl Crawford had combined for a total of three stolen bases in as many attempts entering Monday night. Ellsbury recorded his second stolen base of the season in the seventh inning. Valentine explained not calling for a steal in what seemed like an obvious opportunity Sunday night, when the Sox had runners at the corners with one out and Adrian Gonzalez at the plate in the sixth inning. Gonzalez wound up grounding into a double play. Jarrod Saltalamacchia, who caught all 10 innings Sunday night, got his first start of the season at designated hitter Monday night. “I just felt it was either Salty or Cody, and I just thought Cody would be a better option pinch hitting, if I needed it,’’ Valentine said. “Get Salty off his legs after coming in at 3:30 in the morning and give Cody a day off because he’s been grinding it out. All were contributing factors.’’ . . . Scott Atchison, on the DL since July 14 with right forearm tightness, underwent an MRI Monday after experiencing elbow discomfort following a rehab assignment Friday with Triple A Pawtucket in Indianapolis, where he allowed three runs on three hits, including a two-run homer. The team was awaiting the results. “It seemed like he went in with a forearm and it might’ve moved back a little, closer to the elbow,’’ Valentine said. “Seemed like 15 days ago it was just going to be a couple of days rest. Then we gave him a lot of rest and when he threw it didn’t feel good the next day.’’ . . . Andrew Bailey flew Monday to Fort Myers, Fla., where he’ll do a Gulf Coast League rehab stint Wednesday . . . Daisuke Matsuzaka, on the DL with a right upper trapezius strain, went 2⅓ scoreless innings in a rehab stint with Pawtucket vs. Scranton/Wilkes-Barre Monday night. He threw 47 pitches and allowed four hits and one walk, leaving a man at first while striking out three . . . Shortstop Diory Paulino Monday was suspended 50 games after testing positive for a performance enhancing drug under the minor league testing program. The 18-year-old free agent played two games for Boston’s team in the Dominican Summer League this year and was released. The suspension will take effect if Paulino signs with a big league team. Michael Vega can be reached at vega@globe.com. Material from the Associated Press was used.